Hi loves, I am back from my Europe trip and it was almost suu-mmer over there. It felt like summer though, with the sun gracefully flaring its ray. That was my first time visiting Europe therefore I didn't know that it would be as hot as here in Indonesia. I didn't pack any sun protection lotions which resulted in my face being roasted under the heating sun. My skin face becomes awfully red, uneven, not to mention, darker. I was literally crying on the inside every time I see my face in the mirror. I have to put on bb cream or foundation every time I go out because my forehead is twice darker than the other parts of my face! This has became a routine until one day, W.LAB White Holic Quick Whitening Cream showed up. I immediately knew that I needed it. As most of you know, W.LAB is a rising brand that many popular girl groups and actresses preferred in Korea. And this is not the first time I tried W.LAB product, I have tried their Sebum Out Peel Off Pack last month. I got this product from CHARIS and you can buy it here: https://hicharis.net/cathysie/1uS (p.s. the original price is Rp.384167, but if you buy from my shop the price is reduced to Rp.244332 only! + free shipping!). My first impression is that their packaging is really adorable with all the dots around the product. It comes in a squeeze-type product. So all you need to do is squeeze the product and it will come out according to how strong you squeeze. When you squeeze, a white milky liquid comes out from the product. The white milky liquid has a very light texture so it is not greasy at all. The product main ingredient is Oryza Sativa (rice) Bran Extract which has a great whitening effectI never try any skincare product on my face directly, I always try it on my hand first because I have to see first whether the product goes well with my skin and that it doesn't cause my skin to irritate. Therefore, I applied the product on my hand first. Since it has a very light texture it was easy to blend. With just a few finger rubbing, it gets absorbed into the skin like a light lotion. I tried it on half of my hand for you to see the difference. Can you see the difference? Half of my hand is whiter than the other! My skin becomes brighter by one to two shade! This product even has shimmery finish so your skin will glow like those Korean celebrities that has a healthy glowing skin. Not only polishes your skin, W.LAB White Holic Quick Whitening Cream is also awesomely moisturising. Your skin will feel moisturise immediately after you use the product. 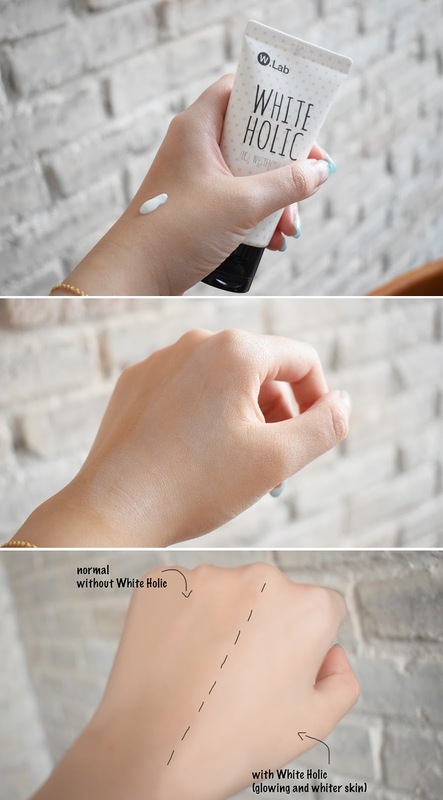 I am so amazed with W.LAB White Holic Quick Whitening Cream, and I truly recommend this product for those who are looking for an immediate result and want a whiter skin.